Grant, we beseech thee, O Lord, that the merits of the spouse of thy most holy Virgin-mother may be assisting to us; and what we cannot obtain through our own weakness, may it be granted to us by his prayers. Who livest and reignest, world without end. Amen. He that is King, the God of Kings, the Lord of the earth, at whose bidding hell trembles, and before whom heaven prostrates ready to do his will,—yea, even He makes himself subject to thee. To th’ ever Virgin Bride. And God, made man, reveals. And joy succeed’s thy pain. On earth dost God possess. ℣. He appointed him Lord of his house. ℟. And chief over all he had. To-day, it is Joseph, the Spouse of Mary, the Foster-Father of the Son of God, that comes to cheer us by his dear presence. In a few days hence, the august mystery of the Incarnation will demand our fervent adorations: who, after the Angel of the Annunciation, could better prepare us for the grand Feast, than he that was both the confidant and faithful guardian of the divine secret? The Son of God, when about to descend upon this earth to assume our human nature, would have a Mother; this Mother could not be other than the purest of Virgins, and her divine Maternity was not to impair her incomparable Virginity. Until such time as the Son of Mary were recognised as the Son of God, his Mother's honour had need of a protector: some man, therefore, was to be called to the high honour of being Mary's Spouse. This privileged mortal was Joseph, the chastest of men. Heaven designated him as being the only one worthy of such a treasure: the rod he held in his hand, in the Temple, suddenly produced a flower, as though it were a literal fulfilment of the prophecy of Isaias: There shall come forth a rod from the root of Jesse, and a flower shall rise up out of his root (Isaias, xi. 1). The rich pretenders to an alliance with Mary were set aside; and Joseph was espoused to the Virgin of the House of David, by a union which surpassed in love and purity everything the Angels themselves had ever witnessed. But he was not only chosen to the glory of having to protect the Mother of the Incarnate Word; he was also called to exercise an adopted paternity over the very Son of God. So long as the mysterious cloud was over the Saint of Saints, men called Jesus the Son of Joseph, and the Carpenter's Son. When our Blessed Lady found the Child Jesus in the Temple, in the midst of the Doctors, she thus addressed him: Thy father and I, sorrowing, have sought thee (St. Luke, ii. 48); and the holy Evangelist adds, that Jesus was subject to them, that is, that he was subject to Joseph as he was to Mary. Who can imagine or worthily describe the sentiments which filled the heart of this man, whom the Gospel describes to us in one word, when it calls him the just man (St. Matth, i. 19)? Let us try to picture him to ourselves amidst the principal events of his life:—his being chosen as the Spouse of Mary, the most holy and perfect of God's creatures; the Angel's appearing to him, and making him the one single human confidant of the mystery of the Incarnation, by telling him that his Virgin Spouse bore within her the fruit of the world's salvation; the joys of Bethlehem, when he assisted at the Birth of the Divine Babe, honoured the Virgin Mother, and heard the Angels singing; his seeing, first the humble and simple Shepherds, and then the rich Eastern Magi, coming to the stable to adore the new-born Child; the sudden fears which came on him, when he was told to arise, and, mid-night as it was, to flee into Egypt with the Child and the Mother; the hardships of that exile, the poverty and the privations which were endured by the hidden God, whose foster-father he was, and by the Virgin Spouse, whose sublime dignity was now so evident to him; the return to Nazareth, and the humble and laborious life led in that village, where he so often witnessed the world's Creator sharing in the work of a Carpenter; the happiness of such a life, in that cottage where his companions were the Queen of the Angels and the Eternal Son of God, both of whom honoured, and tenderly loved him as the head of the family:—yes, Joseph was beloved and honoured by the uncreated Word, the Wisdom of the Father, and by the Virgin, the master-piece of God's power and holiness. Such a life could not close save by a death that was worthy of so great a Saint. The time came for Jesus to quit the obscurity of Nazareth, and show himself to the world. His own works were henceforth to bear testimony to his divine origin; the ministry of Joseph, therefore, was no longer needed. It was time for him to leave this world, and wait, in Abraham's bosom, the arrival of that day, when heaven's gates were to be opened to the just. As Joseph lay on his bed of death, there was watching by his side He that is the master of life, and that had often called this his humble creature, Father. His last breath was received by the glorious Virgin Mother, whom he had, by a just right, called his Spouse. It was thus, with Jesus and Mary by his side, caring and caressing him, that Joseph sweetly slept in peace. The Spouse of Mary, the Foster-Father of Jesus, now reigns in heaven with a glory which, though inferior to that of Mary, is marked with certain prerogatives which no other inhabitant of heaven can have. From heaven, he exercises a powerful protection over those that invoke him. In a few weeks from this time, the Church will show us the whole magnificence of this protection; we shall be having a special Feast in honour of the Patronage of St. Joseph [the Workman]. What the Liturgy proposes to us to-day, are his glories and privileges. The glorious St. Joseph was lineally descended from the greatest kings of the tribe of Juda, and from the most illustrious of the ancient patriarchs; but his true glory consisted in his humility and virtue. The history of his life hath not been written by men; but his principal actions are recorded by the Holy Ghost himself. God intrusted him with the education of his divine Son, manifested in the flesh. In this view he was espoused to the Virgin Mary. It is an evident mistake of some writers, that by a former wife he was the father of St. James the Less, and of the rest who are styled in the gospels the brothers of our Lord; for these were only cousin-germans to Christ, the sons of Mary, sister to the Blessed Virgin, wife of Alphӕus, who was living at the time of our Redeemer's crucifixion. St. Jerom assures us, that St. Joseph always preserved his virgin chastity; and it is of faith that nothing contrary thereto ever took place with regard to his chaste spouse, the blessed Virgin Mary. He was given her by heaven to be the protector of her chastity, to secure her from calumnies in the birth of the Son of God, and to assist her in his education, and in her journeys, fatigues, and persecutions. How great was the purity and sanctity of him who was chosen the guardian of the most spotless Virgin! This holy man seems, for a considerable time, to have been unacquainted that the great mystery of the Incarnation had been wrought in her by the Holy Ghost. Conscious therefore of his own chaste behavior towards her, it could not but raise a great concern in his breast, to find that, notwithstanding the sanctity of her deportment, yet he might be well assured that she was with child. But being a just man, as the scripture calls him, and consequently possessed of all virtues, especially of charity and mildness towards his neighbor, he was determined to leave her privately, without either condemning or accusing her, committing the whole cause to God. These his perfect dispositions were so acceptable to God, the lover of justice, charity, and peace, that before he put his design in execution, he sent an angel from heaven not to reprehend anything in his holy conduct, but to dissipate all his doubts and fears, by revealing to him this adorable mystery. How happy should we be if we were as tender in all that regards the reputation of our neighbor; as free from entertaining any injurious thought or suspicion, whatever certainty our conjectures or our senses may seem to rely on; and as guarded in our tongue! We commit these faults only because in our hearts we are devoid of that true charity and simplicity, whereof St. Joseph sets us so eminent an example on this occasion. “O astonishing elevation! O unparalleled dignity!” cries out the pious Gerson, in a devout address to St. Joseph, “that the mother of God, queen of heaven, should call you her lord; that God himself, made man, should call you father, and obey your commands. O glorious Triad on earth, Jesus, Mary, Joseph, how dear a family to the glorious Trinity in heaven, Father, Son, and Holy Ghost! Nothing is on earth so great, so good, so excellent.” Amidst these his extraordinary graces, what more wonderful than his humility! He conceals his privileges, lives as the most obscure of men, publishes nothing of God's great mysteries, makes no further inquiries into them, leaving it to God to manifest them at his own time, seeks to fulfil the order of providence in his regard, without interfering with anything but what concerns himself. Though descended from the royal family which had long been in possession of the throne of Judӕa, he is content with his condition, that of a mechanic or handicraftsman, and makes it his business, by laboring in it, to maintain himself, his spouse, and the divine Child. We should be ungrateful to this great saint, if we did not remember that it is to him, as the instrument under God, that we are indebted for the preservation of the infant Jesus from Herod's jealousy and malice, manifested in the slaughter of the Innocents. An angel appearing to him in his sleep, bade him arise, take the child Jesus, and fly with him into Egypt, and remain there till he should again have notice from him to return. This sudden and unexpected flight must have exposed Joseph to many inconveniences and sufferings in so long a journey, with a little babe and a tender virgin, the greater part of the way being through deserts, and among strangers; yet he alleges no excuses, nor inquires at what time they were to return. St. Chrysostom observes that God treats thus all his servants, sending them frequent trials, to clear their hearts from the rust of self-love, but intermixing seasons of consolation. “Joseph,” says he, “is anxious on seeing the Virgin with child; an angel removes that fear; he rejoices at the child's birth, but a great fear succeeds; the furious king seeks to destroy the child, and the whole city is in an uproar to take away his life. This is followed by another joy, the adoration of the Magi: a new sorrow then arises; he is ordered to fly into a foreign unknown country, without help or acquaintance.” It is the opinion of the fathers, that upon their entering Egypt, at the presence of the child Jesus, all the oracles of that superstitious country were struck dumb, and the statues of their gods trembled, and in many places fell to the ground, according to that of Isaiah xix. And the statues of the Egyptians shall be shaken in his presence. The fathers also attribute to this holy visit the spiritual benediction poured on that country, which made it for many ages most fruitful in saints. After the death of king Herod, which was notified to St. Joseph by a vision, God ordered him to return with the child and his mother into the land of Israel, which our saint readily obeyed. But when he arrived in Judӕa, hearing that Archelaus succeeded Herod in that part of the country, apprehensive he might be infected with his father's vices—cruelty and ambition—he feared on that account to settle there, as he would otherwise probably have done, for the more commodious education of the child. And, therefore, being directed by God in another vision, he retired into the dominions of his brother, Herod Antipas, in Galilee, to his former habitation in Nazareth, where the wonderful occurrences of our Lord's birth were less known. St. Joseph being a strict observer of the Mosaic law, in conformity to its direction, annually repaired to Jerusalem to celebrate the passover. Archelaus being banished by Augustus, and Judӕa made a Roman province, he had now nothing more to fear at Jerusalem. Our Saviour being advanced to the twelfth year of his age, accompanied his parents thither; who having performed the usual ceremonies of the feast, were now returning with many of their neighbors and acquaintance towards Galilee, and never doubting but that Jesus had joined himself with some of the company, they travelled on for a whole day's journey without further inquiry after him, before they discovered that he was not with them. But when night came on, and they could hear no tidings of him among their kindred and acquaintance, they, in the deepest affliction, returned with the utmost speed to Jerusalem: where, after an anxious search of three days, they found him in the temple, sitting among the learned doctors of the law, hearing them discourse, and asking them such questions as raised the admiration of all that heard him, and made them astonished at the ripeness of his understanding: nor were his parents less surprised on this occasion. And when his mother told him with what grief and earnestness they had sought him, and to express her sorrow for that, though short, privation of his presence, said to him: “Son, why hast thou thus dealt with us? Behold, thy father and I sought thee in great affliction of mind;” she received for answer, that being the Messias and Son of God, sent by his Father into the world in order to redeem it, he must be about his Father's business, the same for which he had been sent into the world; and therefore that it was most likely for them to find him in his Father's house: intimating that his appearing in public on this occasion was to advance his Father's honor, and to prepare the princes of the Jews to receive him for their Messias; pointing out to them from the prophets the time of his coming. But though in thus staying in the temple, unknown to his parents, he did something without their leave, in obedience to his heavenly Father, yet in all other things he was obedient to them, returning with them to Nazareth, and there living in all dutiful subjection to them. Aelred, our countryman, abbot of Rieval, in his sermon on losing the child Jesus in the temple, observes that this his conduct to his parents is a true representation of that which he shows us, while he often withdraws himself for a short time from us to make us seek him the more earnestly. He thus describes the sentiments of his holy parents on this occasion: “Let us consider what was the happiness of that blessed company, in the way to Jerusalem, to whom it was granted to behold his face, to hear his sweet words, to see in him the signs of divine wisdom and virtue; and in their mutual discourse to receive the influence of his saving truths and example. The old and young admire him. I believe boys of his age were struck with astonishment at the gravity of his manners and words. I believe such rays of grace darted from his blessed countenance as drew on him the eyes, ears, and hearts of every one. And what tears do they shed when he is not with them.” He goes on considering what must be the grief of his parents when they had lost him; what their sentiments, and how earnest their search: but what their joy when they found him again. “Discover to me,” says he, “O my Lady, Mother of my God, what were your sentiments, what your astonishment and your joy when you saw him again, and sitting, not among boys, but amidst the doctors of the law: when you saw every one's eyes fixed on him, every one's ears listening to him, great and small, learned and unlearned, intent only on his words and motions. You now say: I have found him whom I love. I will hold him, and will no more let him part from me. Hold him, sweet Lady, hold him fast; rush on his neck, dwell on his embraces, and compensate the three days' absence by multiplied delights in your present enjoyment of him. You tell him that you and his father sought him in grief. For what did you grieve not for fear of hunger or want in him whom you knew to be God: but I believe you grieved to see yourself deprived of the delights of his presence even for a short time; for the Lord Jesus is so sweet to those who taste him, that his shortest absence is a subject of the greatest grief to them.” This mystery is an emblem of the devout soul, and Jesus sometimes withdrawing himself, and leaving her in dryness, that she may be more earnest in seeking him. But, above all, how eagerly ought the soul which has lost God by sin, to seek him again, and how bitterly ought she to deplore her extreme misfortune! As no further mention is made of St. Joseph, he must have died before the marriage of Cana, and the beginning of our divine Saviour's ministry. We cannot doubt but he had the happiness of Jesus and Mary attending at his death, praying by him, assisting and comforting him in his last moments. Whence he is particularly invoked for the great grace of a happy death, and the spiritual presence of Jesus in that tremendous hour. The church reads the history of the patriarch Joseph on his festival, who was styled the saviour of Egypt, which he delivered from perishing by famine; and was appointed the faithful master of the household of Potiphar, and of that of Pharaoh and his kingdom. But our great saint was chosen by God the saviour of the life of him who was the true Saviour of the souls of men, rescuing him from the tyranny of Herod. He is now glorified in heaven, as the guardian and keeper of his Lord on earth. As Pharaoh said to the Egyptians in their distress: “Go to Joseph;” so may we confidently address ourselves to the mediation of him to whom God, made man, was subject and obedient on earth. The devout Gerson expressed the warmest devotion to St. Joseph, which he endeavored by letters and sermons to promote. He composed an office in his honor, and wrote his life in twelve poems, called Josephina. He enlarged on all the circumstances of his life by pious affections and meditations. St. Teresa chose him the chief patron of her order. In the sixth chapter of her life she writes thus: “I chose the glorious St. Joseph for my patron, and I commend myself in all things singularly to his intercession. I do not remember ever to have asked of God anything by him which I did not obtain. I never knew any one, who, by invoking him, did not advance exceedingly in virtue: for he assists in a wonderful manner all who address themselves to him.” St. Francis of Sales, throughout his whole nineteenth entertainment, extremely recommends devotion to him, and extols his merits, principally his virginity, humility, constancy, and courage. The Syrians and other eastern churches celebrate his festival on the 20th of July; the western church, on the 19th of March. Pope Gregory XV, in 1621, and Urban VIII, in 1642, commanded it to be kept a holyday of obligation. The holy family of Jesus, Mary, and Joseph, presents to us the most perfect model of heavenly conversation on earth. How did those two seraphims, Mary and Joseph, live in their poor cottage! They always enjoyed the presence of Jesus, always burning with the most ardent love for him, inviolably attached to his sacred person, always employed and living only for him. What were their transports in beholding him, their devotion in listening to him, and their joy in possessing him! O heavenly life! O anticipation of the heavenly bliss! O divine conversation! We may imitate them, and share some degree of this advantage, by conversing often with Jesus, and by the contemplation of his most amiable goodness, kindling the fire of his holy love in our breasts. The effects of this love, if it be sincere, will necessarily appear in our putting on his spirit, and imitating his example and virtues; and in our studying to walk continually in the divine presence, finding God everywhere, and esteeming all the time lost which we do not spend with God, or for his honor. Jesus hear us: Jesus graciously hear us. God the Father, Creator of the world, Have mercy on us. God the Son, Redeemer of mankind, Have mercy on us. Holy Mary, Immaculate Virgin, Pray for us. St. Joseph, virgin spouse of a Virgin Mother, Protect us. Protector of the Infant Jesus, Protect us. Protector of Mary, thy chaste spouse, Protect us. Protector of St. Teresa, Protect us. Protector of virgins, Protect us. Protector of those devoted to thy service, Protect us. Protector of all faithful Christians, Protect us. Protector of the afflicted, Protect us. Protector of humble and penitent sinners, Protect us. Protector of the Catholic Church, Protect us. Who wert the protector of Jesus yet unborn, Protect us. Who wert the protector of Jesus in the stable of Bethlehem, Protect us. Who wert the protector of Jesus, delivering him from the tyranny of Herod, Protect us. Who wert the protector of Jesus, assisting him in his necessities, and providing him with food, Protect us. Who wert the protector of Mary, thy spouse, and her most faithful companion, Protect us. Who wert the protector and guardian of the virginity of Mary, Protect us. Protector of all thy devout clients, Protect us. Our good father, patron, and protector, Protect us. Our spiritual protector, Protect us. Our guardian protector, Protect us. Our providential protector, Protect us. O Lamb of God, who takest away the sins of the world, Spare us for the love of him who carried and fed Thee. O Lamb of God, who takest away the sins of the world, Hear us for the love of him who clothed and lodged Thee. O Lamb of God, who takest away the sins of the world, Have mercy on us for the love of him who protected and guarded Thee from the cruelty of Herod. Pray for us, St. Joseph, our protector, That we may be made worthy of the promises of Christ. Let us pray. O God, who by thine ineffable providence hast chosen St. Joseph to be the spouse of the ever-blessed Virgin, grant us grace to have him for our intercessor in heaven, whom we honour upon earth as our faithful advocate and protector, who livest and reignest world without end. Amen. 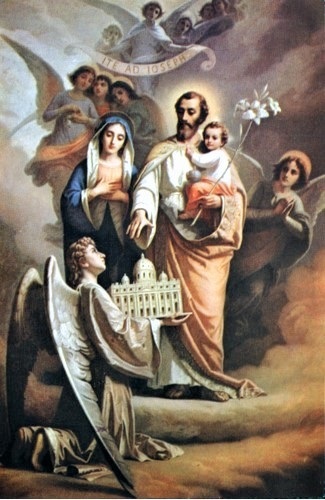 O good St. Joseph, protect us, protect the holy Church.